AgroAtlas - Relatives - Cannabis sativa L. - Hemp sowing. Family: Cannabaceae Endl. 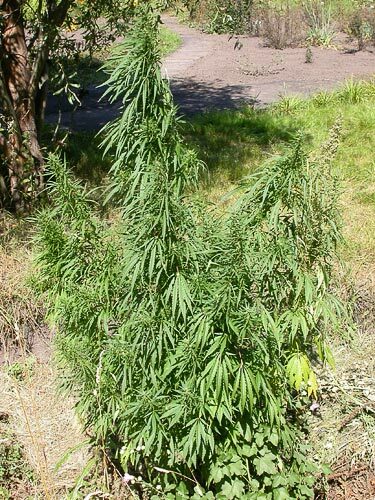 ; Species: Cannabis L.
An annual grassy plant. The stem is upright, 50-150 cm in height, covered by appressed hairs. Leaves with stipules, in the bottom part of a stem are opposite, in the top - alternate. Leaves are on long stalks, 3-5-7 - separate, with lengthened - lanceolate shares, largly - serrate edge. Inflorescences are in the top bosoms of leaves, sprawling. Flowers are dioecious. Female flowers are collected in spicate inflorescences, male's - in panicles. Perianth of female flowers is unseparable, male's - 5-separate. There are 5 stamens. A column is two-separate. A fruit is a nutlet, has grey color, at the basis - without a joint, difficultly falling. Blossoms in June - July, ripens in July - August. The generaldistribution: the East Europe, Western Siberia. In territory of the former USSR: the European part-Transvolgic region and the Bottom Volga; Western Siberia - Altai. In a wild kind - on river adjournment, on rocks, on stony slopes of hills and mountains. Frequently runs to be wild. It is cultivated for a long time for manufacture of a strong fibre, fat oil and essential oil. Fibre is used for making tow, cords, ropes, sails, laces and many other things. Seeds contain up to 35 % of fat oil which is used as food, for manufacture of a soap, for manufacturing drying oil and oil paints. The oil cake goes as a forage to cattle. The resinous substance allocated by flowers, contains cannabine oil and cannabinin, similar to the nicotine, making a basis of narcotic substance of the hashish (hemp) used in medicine. Flora of the Central Siberia, 1979. Malyshev L.I., Peshkova G.A. (ed.). Novosibirsk: Nauka. Т.I, p. 271-272. Flora of the Siberia, 1992. Salicaceae-Amaranthaceae. Krasnoborov I.M., Malyshev L.I. (ed.). Novosibirsk: Nauka, Т.V, p. 75. (in Russian). Flora USSR, 1936. Vol. V. Komarov V.L. (ed.) - M.-L.: Publishing House of Acad. Science, pp. 383-384. (in Russian). Grossgeim, A.A. 1945. Flora of Caucasia. - Baku, Publishing House of Acad. Science of the USSR, Vol. III, appendix. (in Russian). Gubanov, I.A., Kiseleva, K.V., Novikov, B.S., Tihomirov, V.N. 2003. Illus. manual of the Middle Russia plants. Moscow, Vol.II. (in Russian).